Broaden and deepen the awareness and knowledge of economic development. Provide knowledge, tools, resources, and support systems for those practicing economic development. Define the function and applications of economic development, as well as direct links to sustainable and balanced growth. Deliver educational opportunities to those interested in certification and professional development in the field of economic development. Provide skill development for those practicing economic development. 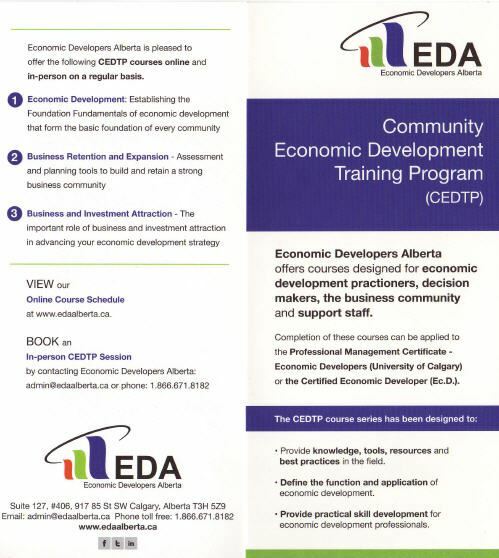 Economic Development – Establishing the Foundation- Learn the principles, theories, and fundamentals of economic development that form the basic foundation of every community. More information here. Business Retention and Expansion - Helps you build and retain a strong business community. Business and Investment Attraction - Learn how business and investment attraction advances your economic development strategy. Economic Development for Elected Officials- Designed specifically for elected officials! Economic Resilience Training for Community and Regional Leaders- An intensive, in-person one or two-day boot camp course to help prepare local elected officials, community leaders and economic developers to support economic development, disaster resilience and economic recovery activities in their community. "This course was very timely and long overdue for our community. A great tool for building on." "The instructor, Natalie Gibson was excellent! There are some unique differences between each of our municipalities, but a lot is also the same. Working together, regionalization, and collaboration across the country is the answer." Among the participants: elected officials, economic development practitioners, and Community Futures representatives.